These Angel Wing Baby Loss Charm Necklaces are the perfect blend of subtle sterling silver, angel wings and birthstone crystal charms plus delicate, hand stamped personalised tags. Never let them go, wish upon a star... they are not so far away. 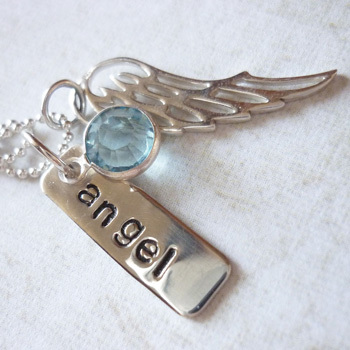 Our custom designed Angel Wing jewellery aims to bring a touch of comfort to Mums who are travelling through miscarriage or stillbirth journeys or have lost their precious baby after birth. A perfect memorial gift from a dear friend or family member who just can't find the right words. And lets face it, who can?